This is my story, my testimony of coming to Christ and living with PTSD. It's my prayer that others who suffer from PTSD will hear this story and seek Christ and the help they may need to overcome their own pain and suffering. Please visit the resource page at www.christcenteredsolutions.org to receive a copy of "Resilience: A Testimony of God's Grace & Healing." to enter for a chance to win a FREE copy of "Marriage and The Family from a Biblical Worldview." This book was developed from several years of writings for my blog "Just Thinking," and answering questions from former church members and clients presented through my years in ministry. 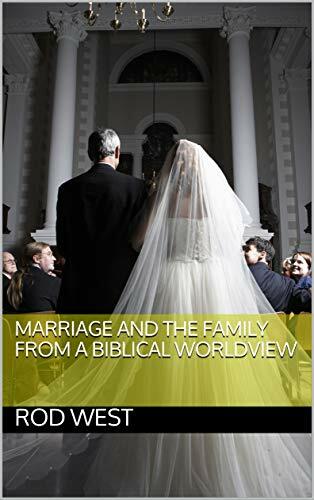 So, this work isn't meant to be an exhaustive study on marriage and family issues, rather it is to serve as a quick help and maybe a conversation starter for small groups and Sunday school classes. There are a few more chapters as well but this is an easy, and I believe, a helpful read. Please know that when you purchase this book you're helping others receive the biblical assistance they're looking for through Christ-Centered Solutions. All funds go directly back into the ministry. ​I’m fifty-five years old and for almost fifty years I’ve lived with fear, shame, anger, and more because of the acts of violence and abuse experienced in my childhood. Through many difficult events I learned various coping skills in order to maintain a sense of control and sanity. One of those skills has been the ability to cover or mask my true feelings, and I have often employed this skill to avoid being hurt anymore than I had been already. Vulnerability and trusting others aren’t my strongest attributes, even now as I’m beginning to open up more than ever before and share my story. For the longest time I thought, “No one will understand unless what happened to me also happened to them.” I felt so alone, and I added to that loneliness by isolating myself more and more with the belief that physical and sexual abuse was rare for little boys, but that my friend is a false belief. Here are some numbers to keep in mind as your feet hit the floor in the morning. About 1 in 10 children will be sexually abused before their 18th birthday. Broken down by gender those numbers are approximately 1 in 6 girls and 1 in 25 boys who will be sexually abused before the age of 18, and typically by someone they know. What’s most shocking is that these numbers are based on reported cases only, the real number is much higher because many people, like me, never reported the abuse. It’s not until years later when we’re no longer able to hide what happened that the stories begin to be told. So, when I recently read about the sexual abuse of 700 children over a twenty-year period in Southern Baptist Churches, I really wasn’t shocked, and I wish I had been. Some may feel the need to begin a defense of the SBC by saying this is a small percentage out of the 46,000 churches associated with the SBC and I would simply say, “there is no defense.” As a pastor, and as a victim, I realize we really need to do more to protect the most helpless and innocent in our care. In the last two days I’ve read and listen to several stories of parents whose children were abused by those in leadership, and I’m a bit numb. These are stories of children who have been changed forever because of the abuse they experienced. Many of these kids grew up self-medicating with alcohol and drugs, some attempted suicide while others were successful. Let me just say I can identify, and these are some of the reasons I began Christ-Centered Solutions near the end of last year. I want to help. I believe there are many still living in the shadows of shame who want to seek help but are afraid to step out and take the risk. To be frank with you, I’m terrified of even putting this blog online. I’m terrified of sharing the fullness of my own story in a few weeks when it will be available on DVD, and part of the reason why is because I know once it’s out there’s no taking it back. I also know that confronting the darkness and sharing with others is the only way to take the power of the secrets away. Isn’t that what we do when we surrender to Christ? We come out of the darkness and into His light, laying our shame and guilt at the foot of His cross. There is power and life in Christ Jesus. There are many other Christians and non-Christians we need to help also. Christian couples aren’t immune from martial issues and many are seeking sound biblical counsel, this includes young couples in need of premarital counseling. There’s also another group I’m really concerned for and that’s other pastors. There’s a growing problem of ministry burnout among this group, but what’s even more disturbing is the increase of suicides among pastors. Rarely does a week pass that I don’t read of a pastor, who seemingly has his act together, and shocks the Christian world when they hear he has taken his life. There is much work to be done in our churches to help both ministers and laity. Listen, I need your help, Christ-Centered Solutions needs your help. For CCS to grow as a ministry and help others we need the financial support of Christians who believe it’s our duty to counsel and minister to other believers in need. In our first four months of operation we’ve provided 143 hours of Biblical counseling and almost all has been at a reduced or free rate, and just so you know, I’m not receiving any compensation for the care provided, yet we do have costs. Some of our funds have aided several families in need of food, housing, and clothing because there was nowhere else to turn at the time. Other costs are simply associated with starting a new ministry. We have legal and processing cost, website, supplies, ministry projects like the “My Story” video, printing teachable materials, and other costs. I’m praying some folks like you will consider becoming a monthly supporter of this Biblical counseling and training ministry. Can you possibly afford $100 a month? How about $50, or any amount per month to help CCS help others? If you can’t, I understand, but please consider maybe a one-time gift to help get us on solid ground. You need to know that CCS is incorporated and registered with the State of South Carolina as a charitable organization. We are also in the process with our lawyers to present, and hopefully, to obtain our nonprofit status with the IRS. Once we are given nonprofit status then all funds which have been donated for up to 27 months can be retroactively deducted on your tax returns. Please visit Christ-Centered Solutions web page and help support this ministry. Once on the website simply click the “Giving Tab” and fill in your information. You’ll have an opportunity once on the giving page to choose a one time or monthly option when giving. Let me also inform you to ignore the “Login Here” button at the top of the page unless you’ve given before and would like to change something on your account. Before I go, let me ask two more things of you. 1) Please share this ministry with your pastor or church leaders so I might have the opportunity to tell them more about how Christ-Centered Solutions can help them and their congregations, and 2) please commit to pray for me and this ministry. A couple of months back, you may remember having received a ministry update from me saying I’d soon again be writing my blogs, and that’s still the plan. My goal for writing has always been to inform and equip Christians how to examine the culture we live in, and with the hope of that what I write helps each believer on a practical level while bringing glory to God. Now, in conjunction with my writing I also hope to add my thirty years of experience as a pastor and a biblical counselor into the mix. I truly desire to help to the Christian community as much as I possibly can before God calls me home. So, I’m in the process of making some changes. My “Just Thinking” blog is now connected to a new ministry known as “Christ-Centered Solutions Inc.” This new ministry has been in development for a long time, and I would go so far as to say it has always been a major part of every ministry I’ve been involved with throughout the years. Back in the early eighties, when I was at Liberty University, I knew what I wanted to do with my life, or so I thought. I was going to graduate in 1986, get a job to support my new family, and attend graduate school to become a Christian clinical psychologist. I was going to help others while secretly “fixing” myself too, (I’ll share this part of the story in another letter/blog to come). I did find a job in the mental health system of North Carolina and shortly thereafter I began attending graduate classes at ASU in Boone, yet things were not right in my life. Long story short, my life and family began to fall apart, and after about two years of suffering I surrendered to what I believed to be God’s call to the ministry. I eventually ended up in seminary at Piedmont Bible College in Winston Salem, NC, and a few years later I finished my courses online while pastoring Ebenezer Baptist Church near the Outer Banks. Let’s go back just a little. While taking classes at Piedmont, and pastoring a small church in the foothills, I was also working part-time in the Wilkes County school system, writing and carrying out behavior modification programs for troubled kids. No matter where I was or what I was doing, counseling in some form was always a part of my work and ministry. I was working with kids and teachers during the day and church folks at all other times. From the mountains of NC to the Outer Banks, and from Wilmington to North Charleston, I have constantly been asked to put my biblical counseling skills into practice. I’ve come to accept these skills and abilities as a gift from God, they certainly fit well with my gift of shepherding. I’ve had the privilege of teaching biblical counseling classes to groups at different churches for pastor friends, seminary level course in pastoral care for schools and organizations, and all the while ministering one on one as a biblical counselor to my congregants and others. On August 1, 2018, I officially began the ministry of Christ-Centered Solutions Inc., here in North Charleston, SC. Teresa and I have had many conversations about our future in ministry during the last few years, and I came to the conclusion in 2017 that now was the time to begin forming what would become CCS. From my own personal struggles and to the many other problems and issues believers continue to share with me each week, now is the time for this type of ministry. There’s another reason as well; almost daily I read of pastors having moral failures, struggling with their past, leaving wives and families, and most disturbing – committing suicide because they believe they have no one to turn to. Pastors need pastors too. We need a confidant, other than our wives, who will listen to us with compassion, while at the same time shooting straight with us, holding us accountable to God’s standards and call in our lives. The life of a pastor can be very lonely and discouraging, and I speak of this truth first hand. I serve as the Board Chairman, and Teresa serves as the Treasurer of the corporation. The focus of ministry at Christ-Centered Solutions can best be summed up by the words of the Apostle Paul in Colossians 1:28, (CCS ministry verse). I, and those who will serve with me in this ministry, will proclaim Christ though the counseling and teaching of God’s Word, with the hope that all believers will reach spiritual maturity in Christ. The word translated as “admonish” or “warn” in Colossians 1:28 is “noutheteo” which means to “counsel.” Much like Jay Adams, Dr. John MacArthur, and others, I believe Christians have a responsibility to provide biblically based, Christ-centered counseling to other Christians. As a pastor, I have seen all too often where another pastor felt ill equipped to counsel someone from his own congregation and ended up sending his member to a non-Christian therapist or counselor. While this may work at times, I hold to the belief that the best help for Christians is found in another believer who also holds to a biblical worldview. Every counselor, therapist, psychologist, psychiatrist, and social worker operates from some sort of philosophical worldview that almost always is in opposition to the Scriptures, and therefore Christians need Christ-centered helpers to aid them both spiritually and emotionally. So, to be of the greatest help, CCS has four primary areas of ministry. To provide biblical counsel to individual Christians and couples, especially in premarital and marital areas. Biblical counseling through CCS takes place locally with in person face to face meetings and/or online to help as many Christians as possible. To provide biblical counseling training to small churches, church groups, pastors, and staff members. The hope is that we can equip believers in each congregation with some basic skills in biblical counseling whereby they can then assist pastors and staff with the various spiritual and emotional needs that arise in the local Body. Through CCS I also want to provide counsel and coaching to other pastors, especially those who have little or no staff support. As stated earlier, pastors have a unique set of struggles and need someone to listen to them without condemnation, someone who has “walked the line” before them and can better understand their trials. It’s my hope that church leaders and congregations will see this as a great need that will not only benefit the pastor and his family, but the entire Body of Christ. I also hope to bring awareness and healing to those living in the shadows of despair by sharing my story. I hope these individuals will seek the help they need when they hear what God has done in my life, and others like me, when I speak. What is my story? At present, I’m writing my story of abuse and PTSD. I’ve also recently worked with a film producer here in the Charleston area to get my story out to others. We have one more recording session set for early February, and we’re hoping this short film will be available by the end March 2019. I’d like to ask one more favor of you, and that is will you consider having me come and share my story and vision with your church or small group? As a bonus, when I come, I’ll bring Luna, my service dog if it’s okay, and I’ll share her story and the importance she plays in my life today. One might think I haven't been as active writing as I once was just a few years back, but one would be wrong. I continue to write quite a bit yet I haven't been posting on my blog page. Why? Because what I've been writing has been for my own health and well-being, and I'm not completely ready to share the whole story just yet. I do want to share an article I read the other day that I thought was excellent at explaining what life is like for those who suffer with PTSD, just follow "Twenty Things You Only Know If You Have PTSD". Be on the lookout for new posts coming soon, and information on a new writing project telling my story. For the last ten years, my studies have led me to look more deeply at the culture in which I live, and I've come to some conclusions that sadden me as an American. On the other hand, as a Christian, my findings have reaffirmed what I know to be Scripturally true; Christ Jesus is coming again. I've shared my thoughts with many through sermons, teachings, and writings, but I've never been able to articulate these findings like Ravi Zacharias does in the first part of this new video clip. Please, take a moment and watch at least the first 9 minutes of this interview, and then take some time and contemplate what you just heard. It is my hope that you and I will be stirred to a greater action while there is time. P.S. My concern isn't about a "nationalistic salvation," but for those who do not know Christ as Savior and Lord. The following video is lengthy but well worth the time. Several months ago I started to write a blog on what has become a common practice with many Christians and I decided to hold off until just a few days ago. What changed my mind? A simple but brief texting session with one of my sons spurred me to finish what I began. I hesitated because I suspected my statements would once again run against the grain of the majority. I’m fairly sure a significant number of my Christian brothers and sisters will even disagree with me. Disagreements aren't always negative. Opposing views and conflict should cause us to examine an issue in life more closely. So if you haven’t studied this passage before “Joe” or “Sally” Christian what would your answer be if someone inquired about the rightness or wrongness of believers getting tattoos? Would you say that’s just the Old Testament and it no longer applies to us today? Or would you take a more defensive approach and answer the question with another question? A defensive posture would be to question the practice of eating certain meats from unclean animals, blending different cloths together, or planting a field with two kinds of seeds also known as intercropping. These three practices were at one time forbidden for God’s people to do but not now. I’m sure many believers would argue that the prohibition for tattooing is no different than these other restrictions, and with the establishment of the New Covenant our views on such a practice should change. In support of this argument one most likely would point to a passage such as Acts 10 where God corrects Peter’s attitude concerning things clean and unclean or the writings of the Apostle Paul (I Corinthians 8) where he addresses meats offered to idols. Actually it’s unfair to take one verse out of a particular writing without providing the proper context to the whole article. So, Leviticus 19 begins by focusing on the holiness of God and the statutes which follow are standards for the nation of Israel to keep which reflect His holiness. The keeping of these laws also served as a testimony to the world that God’s people were to be a separate people. Again we need to take the entire passage in its proper context. Each of the laws in Leviticus 19 fall under one of the three distinctions: ceremonial, civil, or moral, and it’s not uncommon as we read the Old Testament to find these distinctions overlapping. Ceremonial laws related to Israel’s worship and ceased with the death, burial, and resurrection of Christ. Civil laws were those which guided Israel’s daily life, and moral laws were those such as the Ten Commandments which addressed man’s relationship with God and other individuals. Of the Ten Commandments, nine are spoken of in the New Testament as still in effect today. We should expect then that a multiplicity of unquestionable behaviors and activities would be categorized under these nine commandments. As one reads through Leviticus 19 it becomes obvious that verses 26 – 31 are religious in nature and address pagan practices dating back to the time of Moses and before. It’s also clear that some of these statutes would fall under the area of civil law while others under the moral banner. One could say there are no specific prohibitions against these practices in the New Testament, but then how does one deal with verse 29 which speaks of turning one’s daughter over to prostitution? Surely all would agree to sell a daughter into prostitution is morally reprehensible. I also believe many Christians would agree that verses 26 and 31 concerning witchcraft and other contrary religious practices are wrong from at least a spiritual standpoint. We cannot isolate one part of a scriptural passage in order to justify or condemn a particular practice we may or may not agree with, in general. Remember many laws overlap where we might find commonality with a civil law and a moral law. When the Apostle Paul wrote to the Church at Corinth he did address at least one pagan practice and the applications derived from this teaching are many today. To make a long story short, Paul essentially states we’re at liberty to partake of some things that were once considered part of pagan rituals but freedom doesn’t necessarily equate to a right action. The bottom line comes back to our Christian witness. Again I’m not saying that getting a tattoo is a sin. What I am questioning is the message we’re sending to other impressionable Christians and the world. In our social media driven society do we really need to see “Sally Christian’s” new tattoo emblazoned across the upper portion of her breast or her lower back? Does “Joe Christian” need to show us his new cross tat and scripture verse on Facebook no matter how good the message may be? When the Church begins to look and act like the secular society in which we live how can we expect the world to see any real distinction? Isn’t the Church called to be different just as the nation of Israel was called to be a separate nation? I hope you know I don’t mean to sound legalistic or judgmental. I’m just asking a question in brotherly love. Maybe you see tattoos as an art form or even a way of expressing your faith. I’m really just questioning the wisdom of the placing and exhibiting of these markings. I realize all Christians have a life before Christ and a life with Christ. I readily admit I’ve made many mistakes in my life and even now I still don’t get everything right. Also, in light of all that is taking place in our world with terrorism, extreme poverty, and assortment of other issues in humanity tattoos aren’t a big deal, but our Christian witness is always significant to a lost and dying world. P.S. No I do not have any tats!